We are proud to be rewarded with certificates and approvals in all sectors, and that comes from serving the client well. We value young talents and we would like to share our success with you. Download Haif company profile, and you will be able to know about us more. We'll be happy to assist you with any inquire you have. Our work is not just limited to construction work, but we are expert in interior designing and in landscaping and more. Haif owns multiple factories, for ready mix concrete and asphalt and steel factory. Haif company have executed a big projects in various secotes, and it was done in high standards. 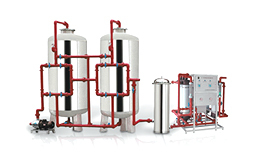 Seawater Desalination and Water purification stations, Sanitation systems and Water treatment stations, Cooling towers, Odor treatments, Water distribution sanitation system, and flood and rainwater treatment networks, Interior and exterior piping network, Dewatering. The division works includes the study of projects, preparation of technical proposals and blueprints, operation and maintenance of water and sanitation projects and all works related. We are proud to say that Haif Water & Sewerage Networks Division understands the requirements of highly complex, yet successful private and public sector projects to the full satisfaction of the Clients. Haif Water & Sewerage Networks Division is able to provide total solutions and undertake a broad spectrum of projects in all related fields. © 2019 Haif Co.. All Rights Reserved.